Beatitude -- means happiness or joy filled. Refers to an inner state of being and not a fleeting feeling. 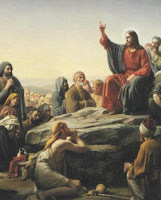 -there is a natural sequence to the Beatitudes. The Beatitudes are eudaemonic, a progressive systems of ethics which defines and enforces moral obligation in relation to happiness or personal well-being. Beatitude 1 - "Blessed are the poor in spirit, for theirs is the kingdom of heaven." 1. the poor in spirit are those who, despite wealth or poverty, are not attached to material goods. 2. Christ as a model of voluntary poverty. He was born with no home and died owning nothing. This is linked to the gift of wisdom--the wise long for heavenly and eternal things, while the rich long for temporal and earthly things. 4. Could read it as -- "blesses are the poor in the new creation for they chase after heavenly things." Beatitude 2 -- "Blessed are the meek, for they shall possess the earth." 1. Aimed at how we should view our selves. With humility. 4. Humility means freedom from pride, anger or arrogance. A modest estimate of ones worth in the sight of God. Where all that is good in me is ascribed to God. 5. Christ taught meekness by his actions. He was the meekest and most humble person to live. 6. The reward of the meek is possession of the earth. "the earth" is a figurative way of saying that their possession will be the multitude of peace. 7. This also takes us back to Psalm 37:11 (New American Bible) where the earth/land refers to the promised land of Israel. But in Christ's mouth it refers to the kingdom of heaven. Beatitude 3 -- "blessed Are they who mourn, for they shall be comforted." 1. Not the pagan mourning of sensuous men but the Christian mourning with love and peace. 2. We mourn her on earth so that we might laugh in heaven with the angels. Like good Friday leading to Easter Sunday. Whereas the world laughs here on earth and thereby mourn for eternity and are never comforted. 3. Mourning that leads to joy. 4. Christ as the perfect mourner. 5. Mourning is prompted by love. We mourn over that what we love when something bad happens or they act foolishly. Love is our motivation. Love of neighbor love of God. The person who does not mourn is the person who does not love. Beatitude 4 -- "blessed are they who hunger and thirst for justice, for they shall be satisfied"
1. Human justice -- concerned with our obligations to our neighbors. Food. Clothing. Money. Work. Life. Liberty. Happiness. 2. Divine justice -- concerned with holiness, doing all of God's Will, love of god and love of neighbor. DJ is the conformity of our entire life to the divine law, love of God and love of neighbor. 3. Hunger and thirst are invitations or requires action. Those who are hungry seek food. Longing for food does not but food in the stomach. 4. Jesus as the most thirsty. "I thirst". Beatitude 5 -- "Blessed are the merciful, for they shall obtain mercy. " 1. Mercy--the virtue disposing the will to pity and relieve the misery of others because we see God in our fellow man. 2. It is an active resolve to relieve others of sorrow and misery as if it were our own. 3. Christ is the model of mercy. The supreme giver of mercy. G To bury the dead. G To pray for the living and the dead. 6. How much more bleak would the world be if people did not adhere to the beatitude of mercy? The saints and various religious orders. How many more poor would have died without mercy? How many more hungry, naked, sick and dying would have suffered with out mercy? Beatitude 6 -- "Blessed are the pure of heart, for they shall see God." 1. Not outward purity. Inward. Sin often approaches us with exterior purity. "The enormity of sin does not seem so revolting if it approaches us well-groomed, well dressed." 2. Possible correspondence of the 6th beatitude with the 6th day of creation. Man lost grace and God's son (Adam) comes into world. By this beatitude in the 6th position man reclaims grace and rids the world of sin. 3. Having a pure heart basically means to have the image of God impressed on the soul by God Himself. 4. Only the pure of heart can see He who is pure heart. 5. Being pure of heart also means to seek God's glory and to ensure and seek the happiness of our neighbor. 6. Purity of heart leads to love which is diffusive and becomes shared with others. 7. What does it mean to "see God"? See God in others, in the created world, and in eternity. Beatitude 7 -- "Blessed are the peacemakers, for they shall be called children of God." 1. This beatitude further expands happiness to our neighbor. 2. As the world sees it is no wars or fighting and a world without Christ who is the prince of peace is what the world understands Peace to be. 3. Peace of Christ -- is the tranquility of order. When all things have been ordered accordingly and subordinate to the good Himself. That is the peace of Christ. A properly ordered building constructed rightly will last. A poorly ordered building built with corners cut will only fall and cause strife and unrest for its tenets. 4. Fruits of peace is a little house of heaven on earth. 5. We cannot begin making peace in the world, with our neighbor or our self if we have not first made our peace with God. Beatitude 8 -- "Blessed are they who are persecuted for the sake of righteousness, for theirs is the kingdom of heaven." 1. First, this beatitude brings us back to the first two beatitudes. 2. Second only this one and the first beatitude are in the present tense. 3. Brings to mind the redemptive suffering and what Tertullian is said to have spoken: "The blood of the martyrs is the seed of the church." preserving and propagating the others, they willingly suffer death and all kinds of confusion and pain." 5. Christ as the model of he who was and is most persecuted against. 7. Call to pick up our cross and follow Christ. 8. Only through suffering will the blessings. Like the "beloved son" in old test and Christ in the new. We are all God's beloved son and there for we will suffer. Will that suffering be on the righteousness path and lead us to heaven or will we all suffering to be empty and meaningless and there by be unintelligible. St. Augustine says that "it is not the pain but the cause that makes the martyr." 9. Abbé Huvelin -- "Holiness and suffering are the same thing...you will never do any good to others save on and by suffering. Our Lord gained the world, not by His discourses, the sermon on the mount, but by His blood, His suffering on the cross." 10. Not every person is called to suffer death for the faith but as St Augustine says "to carry our own mortality is to carry the Cross." "The splendor of the Beatitudes shines forth in the blessed passion of our Lord, which is properly their foundation and origin. For who is poor in spirit unless Christ naked upon the cross? Who is meek unless he who was led as a sheep to the slaughter, and who as a lamb, opened not his mouth? Who mourns, unless he who, with a great cry and tears, offered up supplications for his enemies, who lamented for our sins and had compassion on our miseries? Who hungered and thirsted after justice unless Christ upon the cross, satisfying for our sins and thirsting after the salvation of souls? Who is merciful unless that Samaritan who bore our infirmities upon his own body? Where is cleanliness of heart seen unless in him who cleansed our hearts with his precious blood? Who is [peaceful], unless he who is our peace, and hath reconciled us to God in his blood? Who suffers persecution for the sake of justice, unless he who was crucified by the Jews, against whom men blasphemed and bore lying testimony?" This is absolutely wonderful! I truly wish I had this type of analytical assistance from my own Church! I think I just learned more about the Beatitudes in reading your post then I have in my whole life (and I'm old!). Thank you!